Proponents of the legalization of marijuana have argued for quite some time that decriminalizing cannabis would have many positive social impacts — including fewer people in prisons and less money spent on law enforcement, not to mention all the tax revenue that can be gained through regulation. But there’s one component missing to their argument. Legal weed operations are less environmentally destructive than clandestine operations grown for the black market. Record scratch! What’s this about how illegally growing kush is environmentally bad? Well, a lot, but chiefly: its outsized water usage. It might sound counterintuitive, but weed has long enjoyed a green reputation. And yet, cannabis is also a very thirsty plant, and however legal it is in select states (though verboten, from a federal perspective), it’s the illegal operations that are having quite the negative impact on local watersheds. Before Mary Jane was completely legal in California, the state already produced 60 percent or more of the pot grown in the United States, and growing marijuana had contributed to the worsening water crisis. It’s estimated that one pound of marijuana requires one gallon of water per day. In 2015, it was estimated that in northern California alone, the peak of the pot-growing season (June through October) saw 430 million liters of water used per square kilometer of marijuana crop. For comparison, that’s less than what it takes to grow most fruits, more than it does grapes, and about on-par with the much-maligned almond industry. Much of the water that goes into growing it comes from overused local streams and wetlands. That’s a lot of households that could get more water if the industry weren’t already utilizing it. To top it off, illegal crops in California are often grown in watersheds with endangered water species, including salmon and steelhead trout, and growers are tapping those streams at the same time of year when those animals need the water most. But here’s the key to this whole thing: it’s the illegal growing operations that make a greater environmental impact than the legal ones, partly due to large scale clear-cutting of trees and the soil erosion that follows. Additionally, these impacts do still occur in legal cases because marijuana is becoming legal faster than laws are being written to regulate how it’s grown. Then, there’s the matter of federal law versus state law. In the states where it’s legal to grow and sell pot, we’re also seeing large scale illegal operations that cater to the black market in states where it’s still considered illegal. But even as of late 2017, 80 percent of California’s weed crops were still grown for the black market, so implementing new regulations has been slow. The black market for pot worsens water issues in two ways. First, by diverting streams that go into public waterways into their irrigation systems. Second, by sending large amounts of pesticide, rodenticide, and fertilizers into the water supply. It not only exacerbates the difficulties of California’s dry season, but when those Northern California regions are deluged with two-to-four inches of rain later in the year, the mud under the plants erodes, washing those pesticides, fertilizers, and rat poisons into the public water supply. That’s terrible news, not just for humans, but also for wildlife who depend on those public lands. For example, in Northern California, “trespass grows” (or, clandestine marijuana operations on public land) have been harming a population of the endangered Fisher — an animal that looks like a ferret/wolf hybrid. As one scientist looked deeper into the die off, he discovered that the causes of the fishers’ death weren’t natural at all. The fishers had eaten rats with bellies full of rodenticide from the trespass grows upstream. California is ameliorating the environmental effects of large-scale weed farms by regulating the input and output of legal pot farms with the CalCannabis cultivation licensing system, run by the California Department of Food and Agriculture. This has led to the state’s water board issuing restrictions on the amount of water cannabis growers can divert from streams and tributaries, and regulations to control runoff from cannabis growing operations into water sources. Now, in order for growers to obtain a license, they must demonstrate they have the water rights or agree to further restrictions on surface waters. Responsible weed farming truly is green weed farming. 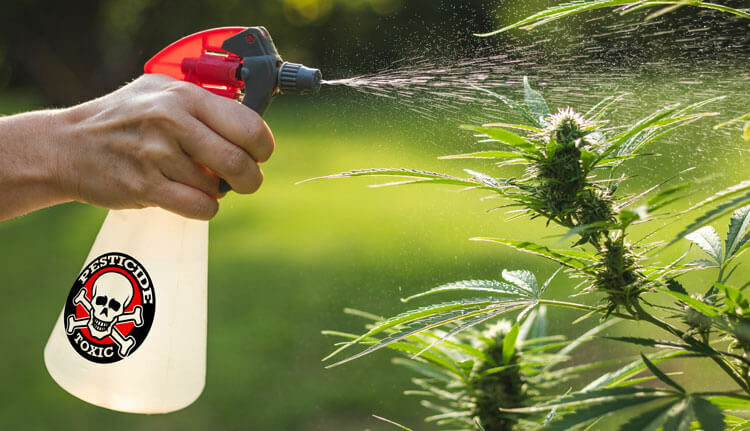 Regulation of marijuana growers’ pesticide, rodenticide, and water usage needs to be regulated to have a responsible weed market. So, lean on your lawmakers to push for environmental regulation. No matter what type of farm is nearby, always, always, always filter your water, especially if you live in Northern California or rely on well water. Yes, in cities, municipal water treatment can take out most of those pesticides, but it’s never quite 100 percent — for example, it still leaves in chlorine and chloramines that are used to disinfect the water. That’s why filtering your drinking water is so essential. Give yourself some peace of mind with proven, healthier water, because healthier water means a happier you. Is Your Tap Water Safe from Unregulated Contaminants?